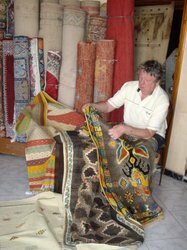 HERE YOU WILL FIND rugs of the size 181 to 275cms., or 6ft. to 9ft. long. with various width sizes. 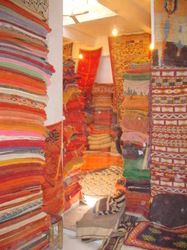 BUYING OLD RUGS in the Medina in Marrakech. 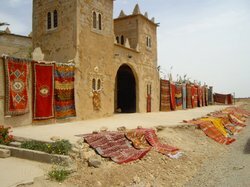 AN OLD FORT near the town of Sidi Mokhtar is used as a collection point and co-operative for rugs woven in homes in the surrounding villages. Sometimes - with luck - a few old pieces are still available. 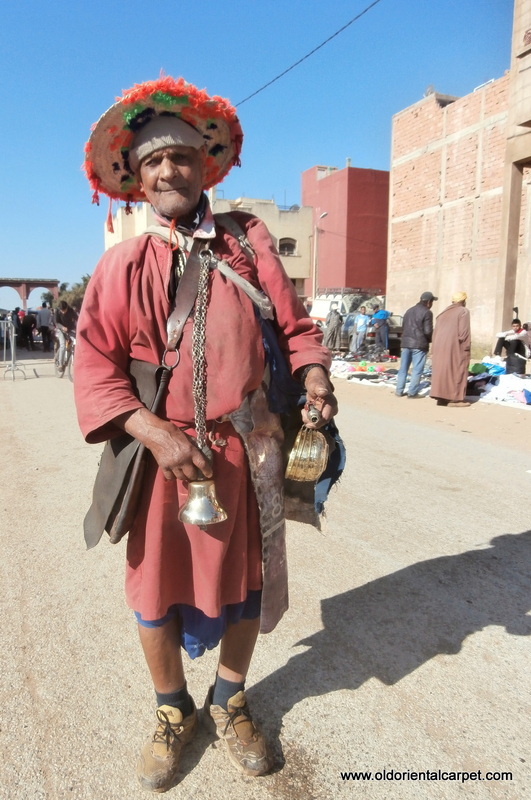 BERBER DESIGNS ARE OFTEN based on the world around them, in this case a life-size portrayal of the water seller who is a vital part of every market day. He wears the broad hat to protect against the scorching sun. Around his neck is his long chain holding his bell and the metal cups he dispenses water in. From the right shoulder his personal old goatskin bag contains money and his daily provisions, while the left bag contains the water. This is a primitive, fascinating expression of Berber life. The foundation is wool and the pile a mixture of wools and shredded textiles. 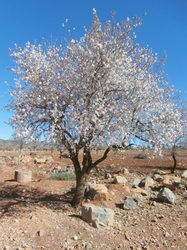 It is from the Middle Atlas. Reference 2678. Size 228 x 145 cm., 7ft. 6ins. x 4ft. 9ins. Euros 420. THIS RUG HAS BEEN SOLD. I took this photo in Khemisset market. Berber designs are often based on the world around them, in this case a life-size portrayal of the water seller who is a vital part of every market day. He wears the broad hat to protect against the scorching sun. Around his neck is his long chain holding his bell and the metal cups he dispenses water in. From the right shoulder his personal old goatskin bag contains money and his daily provisions, while the left bag contains the water. This is a primitive, fascinating expression of Berber life. The foundation is wool and the pile a mixture of wools and shredded textiles. It is from the Middle Atlas. MOROCCAN BERBER MIDDLE ATLAS CARPET. This is from the Beni Mguild group of the Middle Atlas range. The subtle shades range from purplish and brownish reds through to terracotta and deep madder. 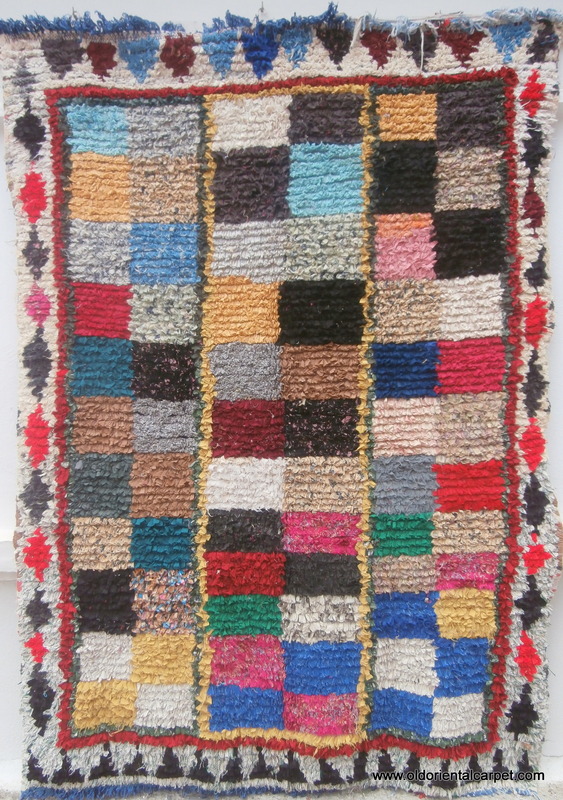 The use of different shades of one general colour is often found in old weavings from the Beni Mguild tribe and several examples can be seen in "Marokko" by Kurt Rainer from page 126. The piece is in excellent condition. Ref. 2120. Size 257 x 198 cms. 8'5" x 6'6". Euros 800. MOROCCAN BERBER MIDDLE ATLAS CARPET. This is from the Beni Mguild group of the Middle Atlas range. The subtle shades range from purplish and brownish reds through to terracotta and deep madder. 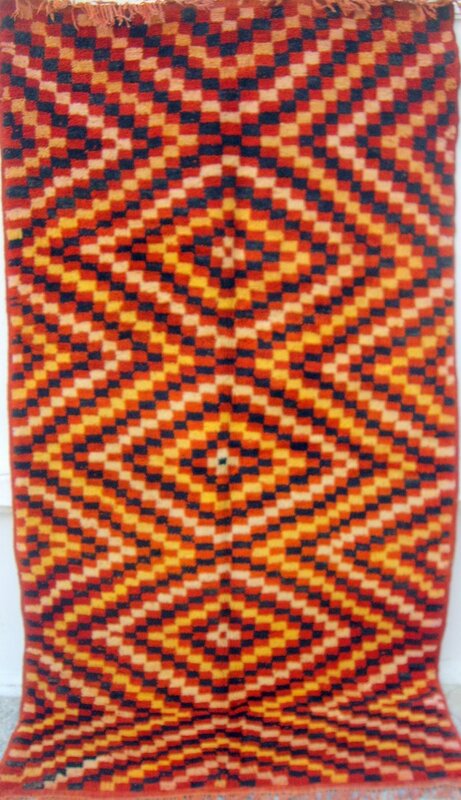 The use of different shades of one general colour is often found in old weavings from the Beni Mguild tribe and several examples can be seen in "Marokko" by Kurt Rainer from page 126. The piece is in excellent condition. Ref. 2120. Size 257 x 198 cms. 8'5" x 6'6". CLOSE UP. MOROCCAN HIGH ATLAS BERBER CARPET. This old carpet is from the region of Ait Ouaouzguite in the High Atlas mountains south of Marrakech. The dyes include colours taken from henna, saffron and curcuma. It is in good original condition with full pile, complete ends and overcasting. 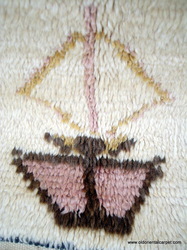 There is a small reweave in the top kilim end border. A similar piece with these panel designs is shown in "From Sign to Image - The Moroccan Carpet" pages 169 to 171. Reference 2078. Size 270 x 160cms, 9ft x 5ft 3ins, Euros 1150. 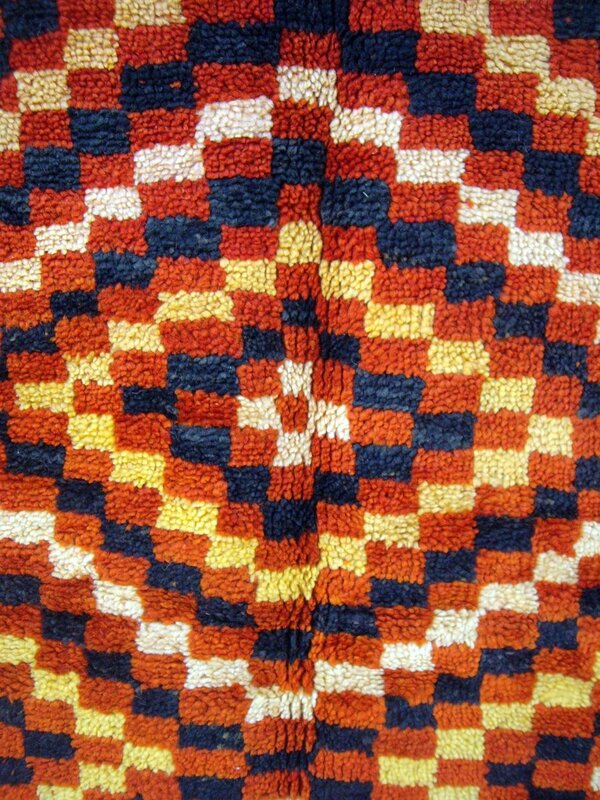 MOROCCAN HIGH ATLAS BERBER CARPET. 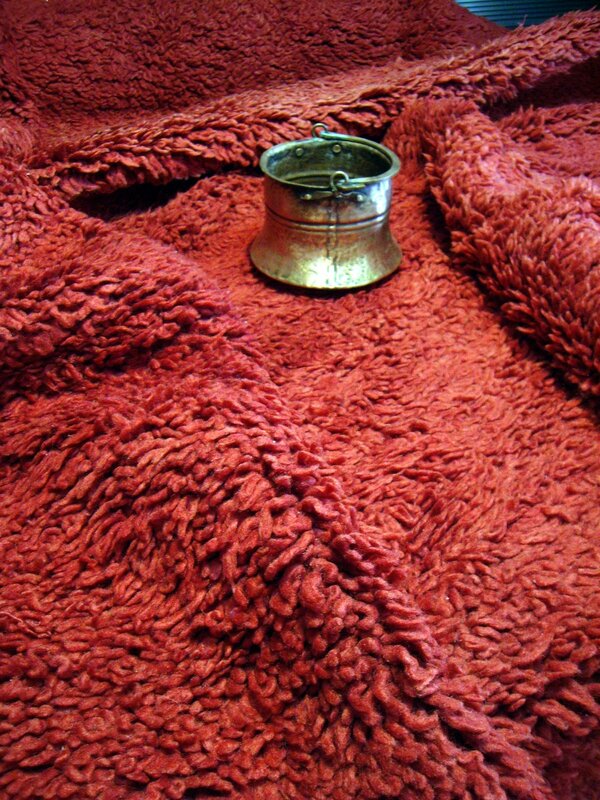 This old carpet is from the region of Ait Ouaouzguite in the High Atlas mountains south of Marrakech. The dyes include colours taken from henna, saffron and curcuma. It is in good original condition with full pile, complete ends and overcasting. 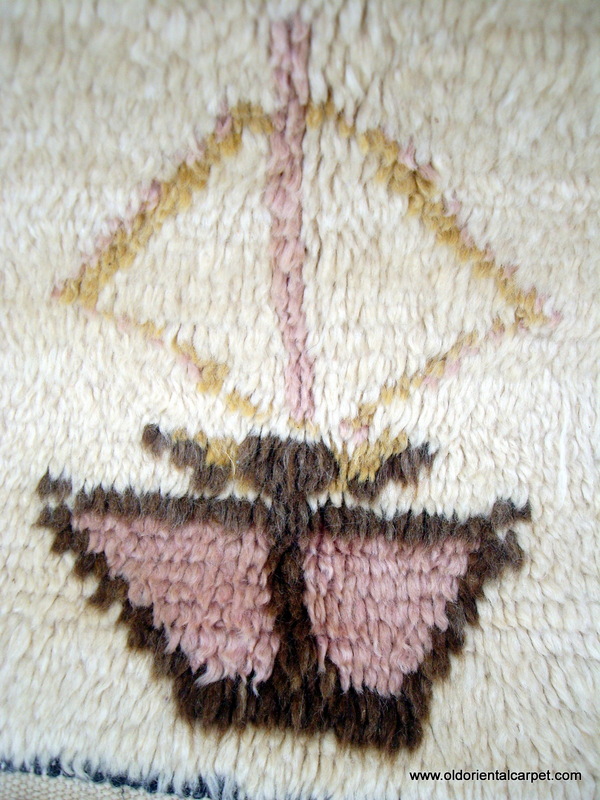 There is a small reweave in the top kilim end border. A similar piece with these panel designs is shown in "From Sign to Image - The Moroccan Carpet" pages 169 to 171. Reference 2078. Size 270 x 160cms, 9ft x 5ft 3ins. CLOSE UP. Only 13 miles separate my home in southern Spain from Morocco. It is only a 35 minute ferry to the northern city of Tangier. From there it is four wheel driving to the edge of the Sahara. 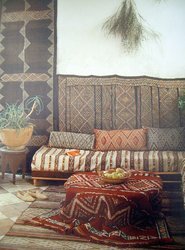 Traditional kilims, cushions and pillows provide a relaxing Moroccan interior. 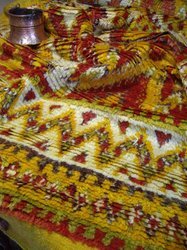 See the sections on Kilims/Flat Weaves and also Woven Bags and Artifacts for many similar examples. MOROCCAN HIGH ATLAS BERBER RUG A gifted weaver has created an almost 3 dimensional look by contrasting central medallions of deep charcoal with lustrous undyed white wool in the field. There is minor use of a very light apricot highlight. 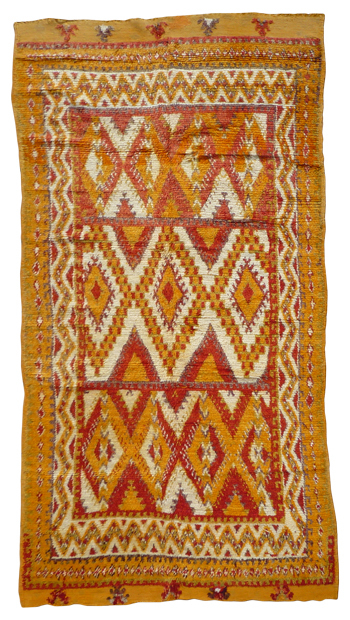 This rug is from the region of Azilal in the foothills of the High Atlas, east of Marrakech. Reference 2553. Size 227 x 142cms. 7ft.5in. x 4ft.8in. Euros 950. MOROCCAN HIGH ATLAS BERBER RUG A gifted weaver has created an almost 3 dimensional look by contrasting central medallions of deep charcoal with lustrous undyed white wool in the field. There is minor use of a very light apricot highlight. 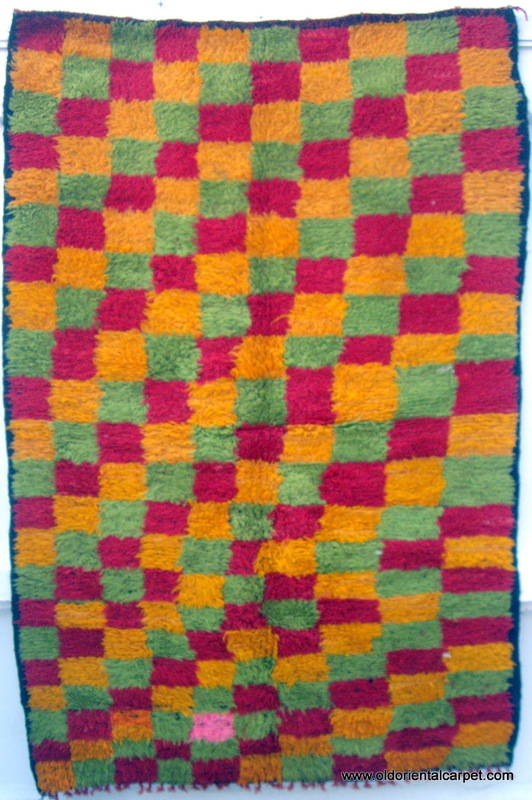 This rug is from the region of Azilal in the foothills of the High Atlas, east of Marrakech. Reference 2553. Size 227 x 142cms. 7ft.5in. x 4ft.8in. CLOSE UP. SPECIAL OFFER .................BELOUCH / BALOUCH RUG which is probably from the Taimani group in western Afghanistan. It is an old piece and is dated in 3 places AH 1348 which is AD 1929. There is corrosion in the black commensurate with age and the rug has even pile and is intact with the original goat hair overcasting, kilim ends and remnants of ornamental tassels. Reference 2631, Size 200 x 122cms. 6ft.6in. x 4ft. Euros 248. SPECIAL OFFER......MOROCCAN BERBER MIDDLE ATLAS RUG from the Berbers of the Boujad region. 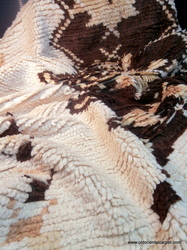 It has a great depth of colours and lustrous wools. 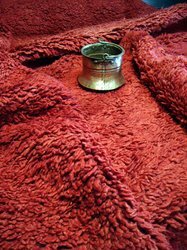 It is old with woollen warps and wefts and wide original overcasting. Reference 2285. Size 230 x 125cms. 7ft.7in. x 4ft.1in. Euros 350. 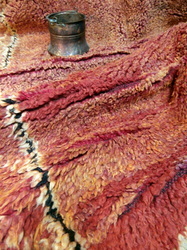 MOROCCAN BERBER BOUCHEROUITE RUG. 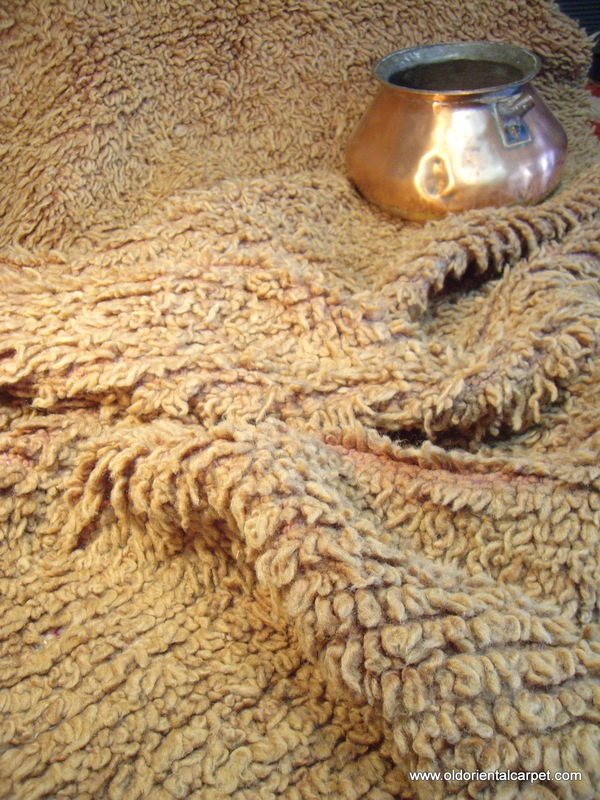 The origin of these completely unique rugs lies in the ability of inventive Berber women weavers and their belief in the saying "waste not, want not". They possessed the looms and the weaving skills and decided to use left over wool and cotton, together with shredded recycled materials and create these rugs for their own homes. Designs are entirely sponaneous and may change several times. Reference 2629. Size 197 x 137cms. 6ft.5in. x 4ft.6in. Euro 350. The colours used in this door of a weaver's house are the same as the MOROCCAN BERBER BOUCHEROUITE RUG opposite. 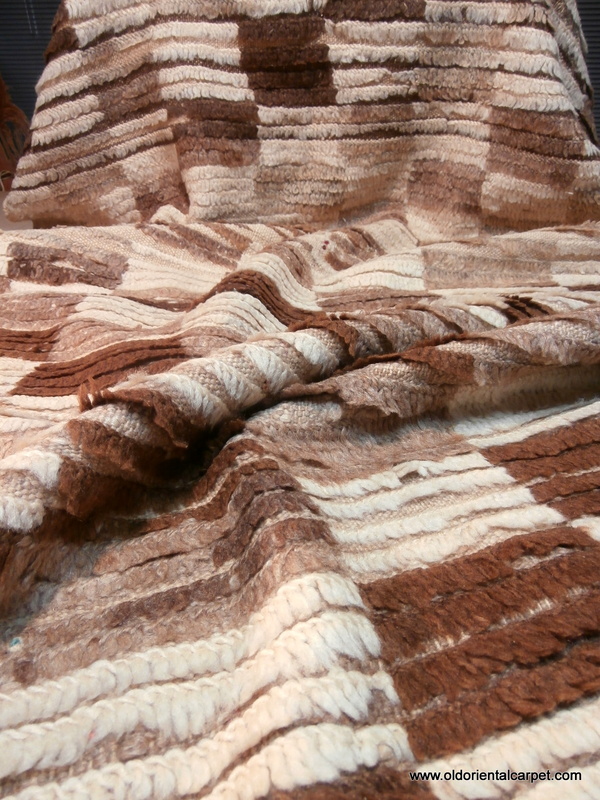 The origin of these completely unique rugs lies in the ability of inventive Berber women weavers and their belief in the saying "waste not, want not". They possessed the looms and the weaving skills and decided to use left over wool and cotton, together with shredded recycled materials and create these rugs for their own homes. MOROCCAN BERBER MIDDLE ATLAS RUG which is old, supple and soft and has a knotted pile of many shades of madder ranging from tan through to reds and hints of purple. It is genuinely old, intact and has interesting kilim ends. It is woven with the Berber knot and originates from the Berbers of Marmoucher in the southern Middle Atlas. Reference 2716. Size 190 x 128cms. 6ft.3in. x 4ft.3in. Euros 825. MOROCCAN BERBER MIDDLE ATLAS RUG which is old, supple and soft and has a knotted pile of many shades of madder ranging from tan through to reds and hints of purple. 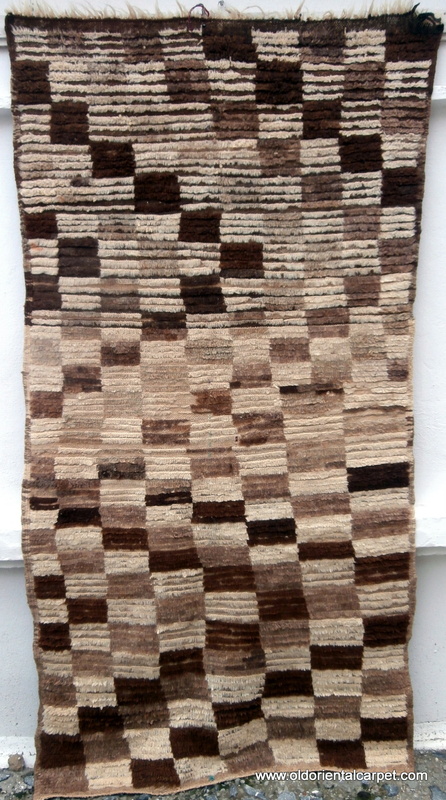 It is genuinely old, intact and has interesting kilim ends. It is woven with the Berber knot and originates from the Berbers of Marmoucher in the southern Middle Atlas. Reference 2716. Size 190 x 128cms. 6ft.3in. x 4ft.3in. CLOSE UP. 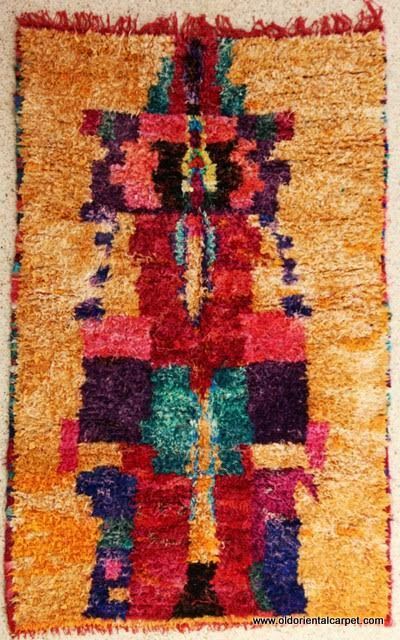 MOROCCAN BERBER HIGH ATLAS RUG. 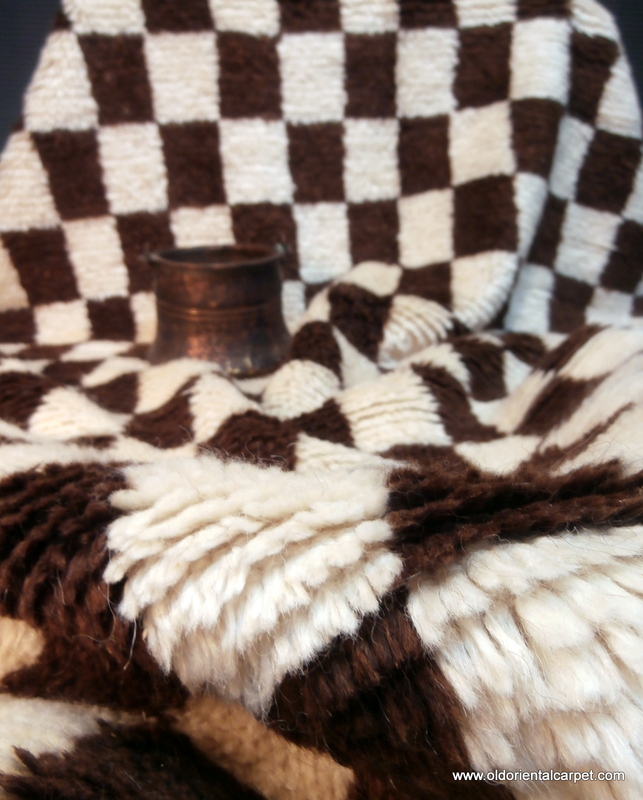 The simplistic designs have been achieved by using only various shades of undyed local Berber wools. The pile is knotted with the unique Berber overlapped knot which is shown in the book "From Sign To Image" on page 33.This is an old piece from the region of Azilal which lies in the foothills of the eastern High Atlas. It is intact and original with interesting braided ends. 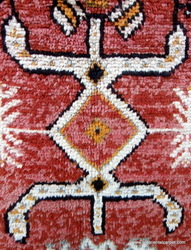 Rugs from this region are well documented in the textbook "Tapis de Tribus" and an example using similar combinations, although for a different design, is featured in Plate 38. Reference 2714. Size 200 x 103cms. 6ft.4in. x 3ft.5in. Euros 390. MOROCCAN BERBER HIGH ATLAS RUG. The simplistic designs have been achieved by using only various shades of undyed local Berber wools. The pile is knotted with the unique Berber overlapped knot which is shown in the book "From Sign To Image" on page 33.This is an old piece from the region of Azilal which lies in the foothills of the eastern High Atlas. It is intact and original with interesting braided ends. 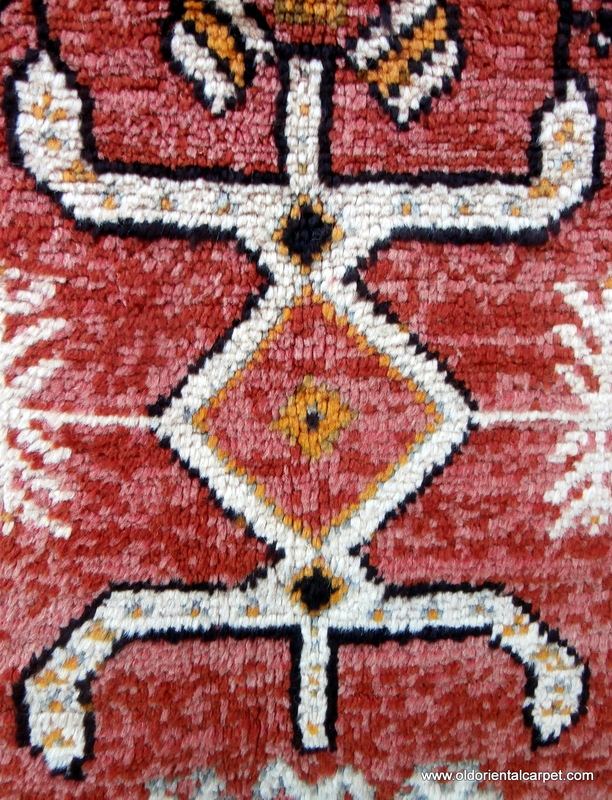 Rugs from this region are well documented in the textbook "Tapis de Tribus" and an example using similar combinations, although for a different design, is featured in Plate 38. Reference 2714. Size 200 x 103cms. 6ft.4in. x 3ft.5in. CLOSE UP. SPECIAL OFFER......MOROCCAN BERBER MIDDLE ATLAS RUG. An exceptionally rare example which is around 60 years old and in impeccable condition. 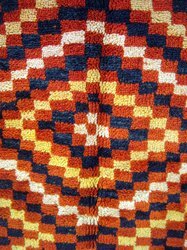 Of all the Berber groups, it is only the Beni M'Guild who use the same wool, as in this case, for the warps, wefts and knotted pile. The weaver added a few warps of recycled material on each side, probably to help it lie flat. The cinnamon and honey colour is the result of the original dyes of wild madder, probably with a little alizarin pigment, mellowing over the decades. The pile is soft and sumptuous. Reference 2373. Size 190 x 90cms. 6ft.5in. x 3ft. Euros 185. SPECIAL OFFER......MOROCCAN BERBER MIDDLE ATLAS RUG. An exceptionally rare example which is around 60 years old and in impeccable condition. 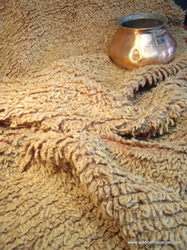 Of all the Berber groups, it is only the Beni M'Guild who use the same wool, as in this case, for the warps, wefts and knotted pile. The weaver added a few warps of recycled material on each side, probably to help it lie flat. The cinnamon and honey colour is the result of the original dyes of wild madder, probably with a little alizarin pigment, mellowing over the decades. The pile is soft and sumptuous. Reference 2373. Size 190 x 90cms. 6ft.5in. x 3ft. CLOSE UP. HUNDREDS OF RUGS, piled floor to ceiling. This is just one of many hidden rug stores in the old Medina. MOROCCAN MIDDLE ATLAS BERBER RUG. 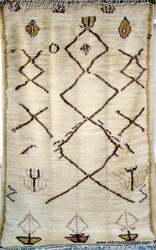 The use of squares and rectangles, as shown here, is peculiar to Berber work from the region of Boujad in the western Middle Atlas. 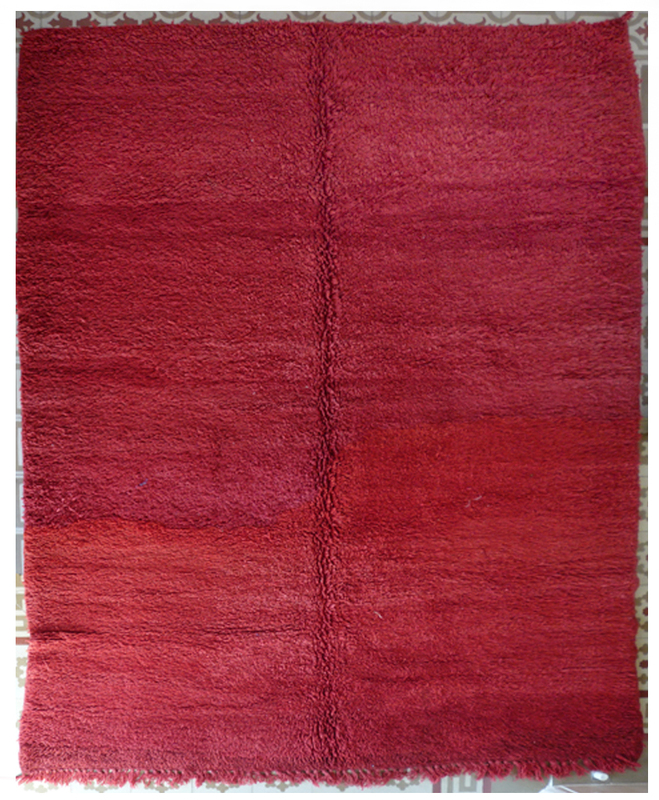 There is a rug in "Marokko" by Kurt Rainer on plate 110 which has identical shades of the red, green and yellow as in this piece. 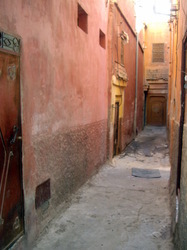 It is attributed to the Beni Mussa Berber sub-tribe. It would make a dramatic wall hanging. Reference 2333. Size 188 x 125cms. 6ft.2in. x 4ft.1in. Euros 190. MOROCCAN MIDDLE ATLAS BERBER RUG. 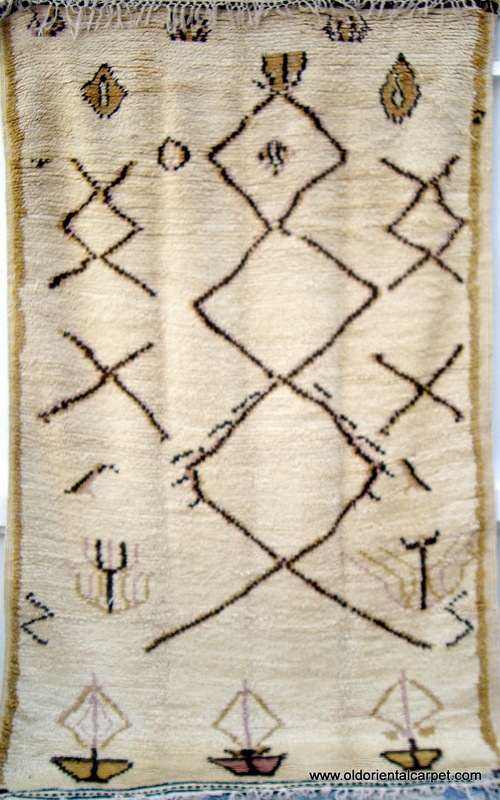 The use of squares and rectangles, as shown here, is peculiar to Berber work from the region of Boujad in the western Middle Atlas. 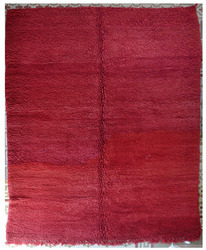 There is a rug in "Marokko" by Kurt Rainer on plate 110 which has identical shades of the red, green and yellow as in this piece. 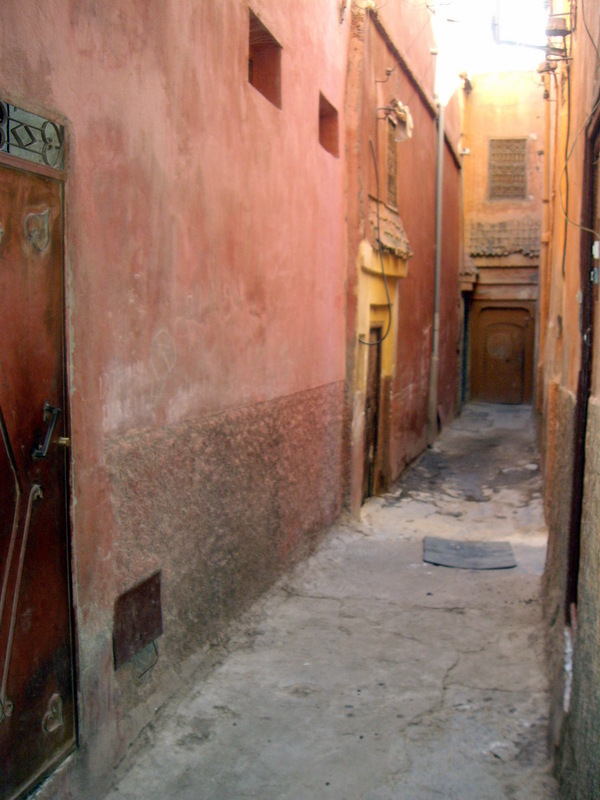 It is attributed to the Beni Mussa Berber sub-tribe. It would make a dramatic wall hanging. Reference 2333. Size 188 x 125cms. 6ft.2in. x 4ft.1in. CLOSE UP. MOROCCAN BERBER RUG from the region of Tazenacht which lies in the High Atlas and is a long, twisting, climbing road south from Marrakesh. 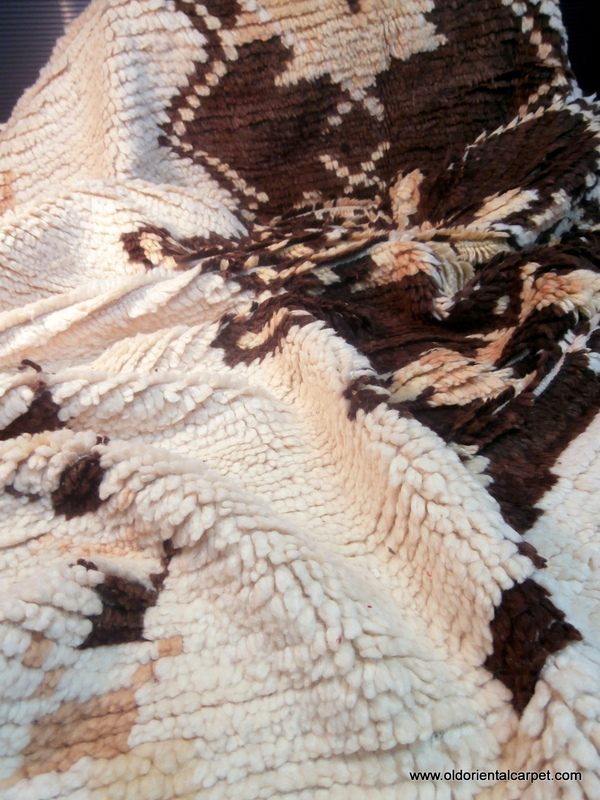 The wools are undyed and the dark squares are shades of the deepest, rich chestnut brown. 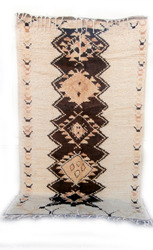 The rug is in perfect condition and has intricate decorative weaving on the kilim ends. A similar piece is shown in the important text book "Taznacht" as plate 2 on page 125. Refrerence 2710. Size 195 x 108 cms., or 6ft. 5ins. x 3ft. 7ins. CLOSE UP. 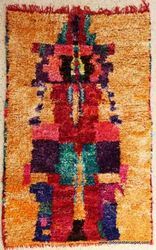 MOROCCAN BERBER RUG from the region of Tazenacht which lies in the High Atlas and is a long, twisting, climbing road south from Marrakesh. 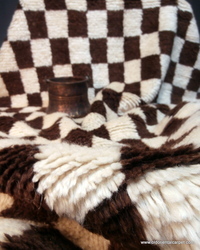 The wools are undyed and the dark squares are shades of the deepest, rich chestnut brown. 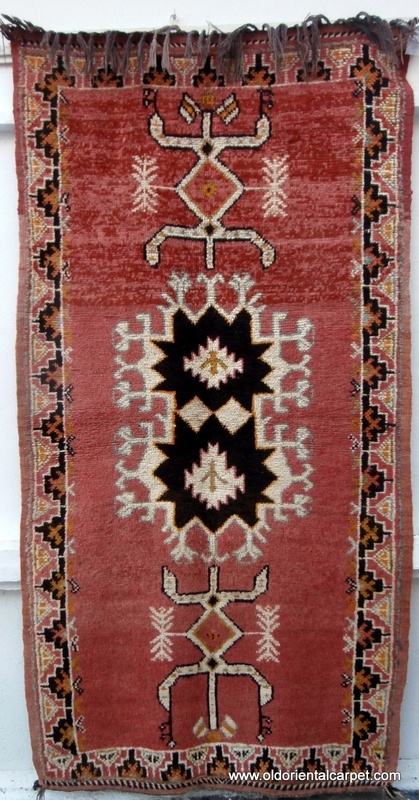 The rug is in perfect condition and has intricate decorative weaving on the kilim ends. A similar piece is shown in the important text book "Taznacht" as plate 2 on page 125. Refrerence 2710. Size 195 x 108 cms., or 6ft. 5ins. x 3ft. 7ins. Euros 585. MOROCCAN HIGH ATLAS BERBER RUG with a long lustrous pile of undyed ivory wools. The deep brown used for design is beautifully outlined with pale lilac and gold. There is an interesting display of a row of flower pots along the bottom border. Reference 2302. Size 206 x 135cms. 6ft.9in. x 4ft.2in. CLOSE UP. MOROCCAN HIGH ATLAS BERBER RUG with a long lustrous pile of undyed ivory wools. The deep brown used for design is beautifully outlined with pale lilac and gold. There is an interesting display of a row of flower pots along the bottom border. Reference 2302. Size 206 x 135cms. 6ft.9in. x 4ft.2in. Euros 720. ROAD SIGN ALL OVER MOROCCO. Often seen but seldom obeyed. 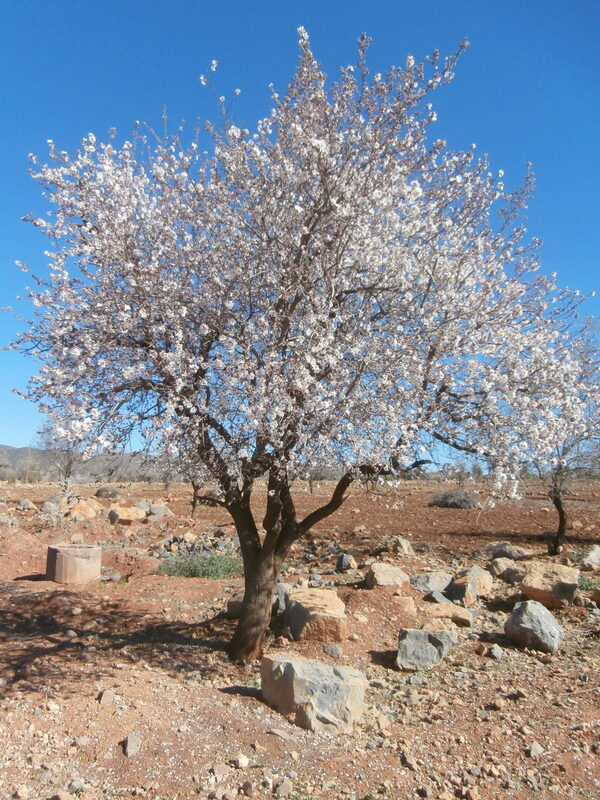 ALMOND TREE IN BLOSSOM in the late winter on the foothills of the High Atlas near Azilal. 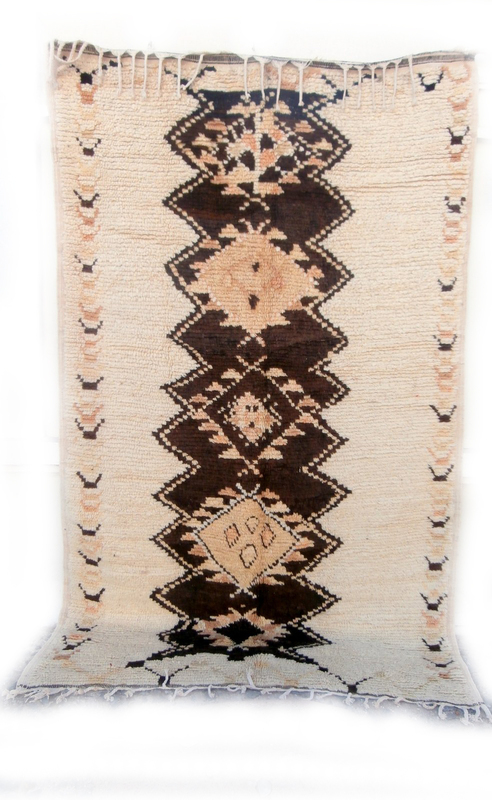 MOROCCAN BERBER RUG originating from the High Atlas mountains and the Ait Ouaouzguite Berbers. 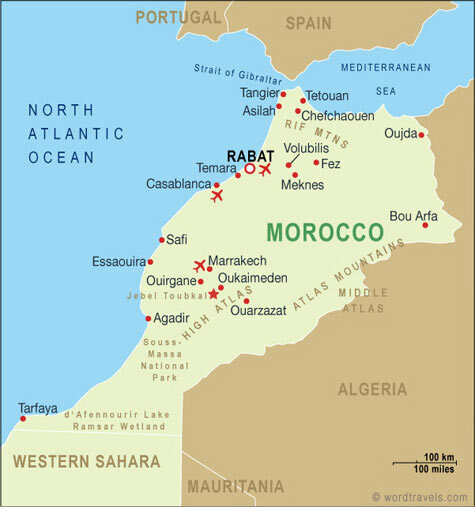 This region lies south of Marrakesh. 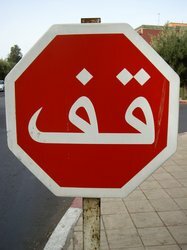 At each end of the field there is a design which translates from the Amazigh language to the word "Berber". The rug is old and in perfect condition. 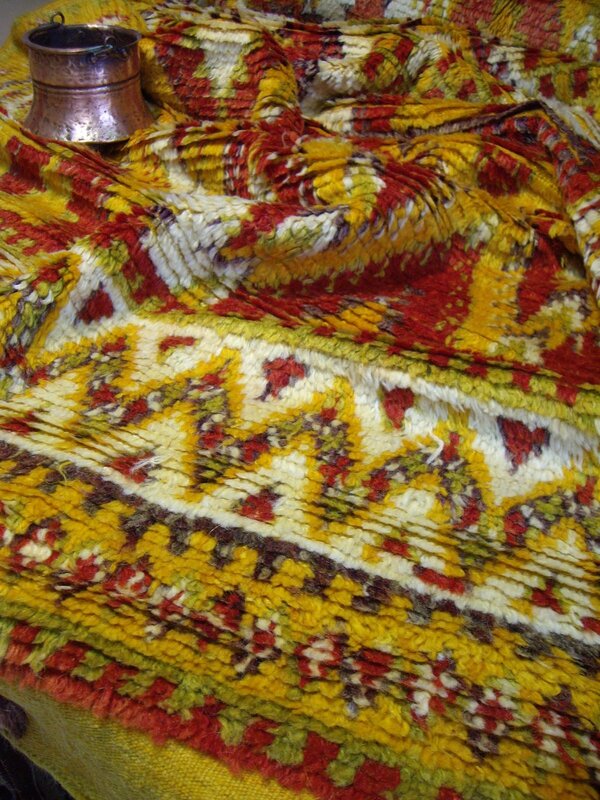 The kilim ends are finished with a decorative embroidery and are intact. 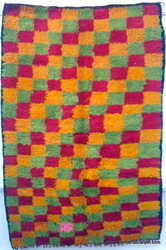 A rug with similar shades of colours and construction is shown in the text book "From Sign to Image" on page 25. 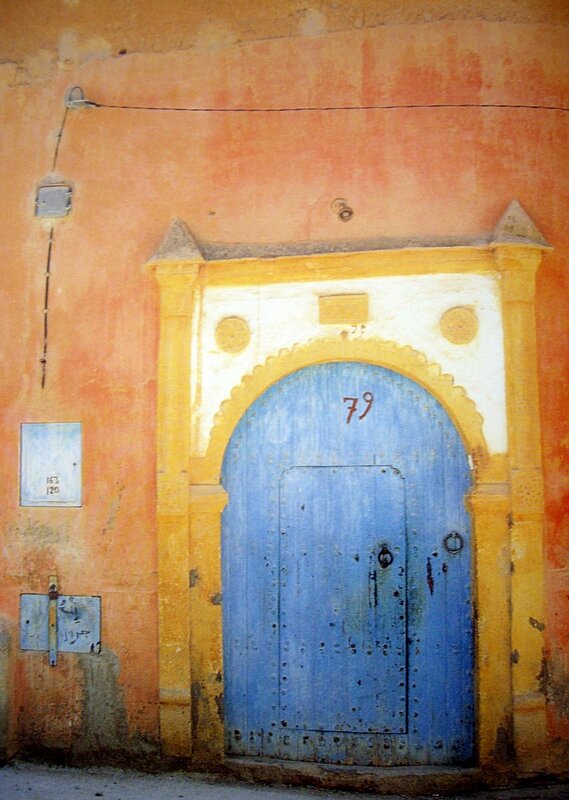 It is also an old piece from Ouaouzguite. Reference 2700. Size 185 x 100 cms., or 6ft. 1ins. x 3ft. 4ins. CLOSE UP. 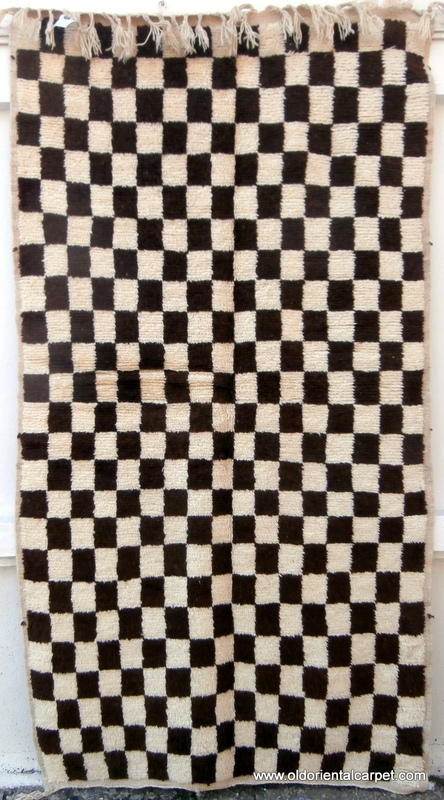 MOROCCAN BERBER RUG originating from the High Atlas mountains and the Ait Ouaouzguite Berbers. 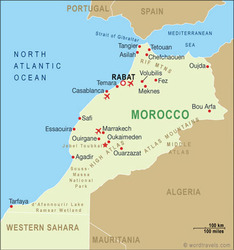 This region lies south of Marrakesh. At each end of the field there is a design which translates from the Amazigh language to the word "Berber". The rug is old and in perfect condition. 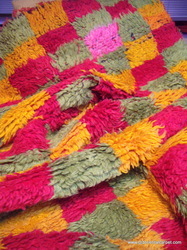 The kilim ends are finished with a decorative embroidery and are intact. 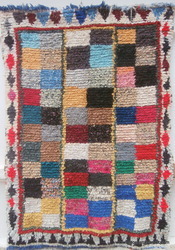 A rug with similar shades of colours and construction is shown in the text book "From Sign to Image" on page 25. It is also an old piece from Ouaouzguite. Reference 2700. Size 185 x 100 cms., or 6ft. 1ins. x 3ft. 4ins. Euros 550.